These grills really know how to stand out in a crowd! The Q 3200 Grill by Weber is loaded with convenience and performance features that will impress any grilling enthusiast. Its two burner cooking system can handle everything from steaks for a dinner party to multiple burgers at the family cookout. Assembly required. Q 3200 Gas BBQ These grills really know how to stand out in a crowd! The Q 3200 Grill by Weber is loaded with convenience and performance features that will impress any grilling enthusiast. Its two burner cooking system can handle everything from steaks for a dinner party to multiple burgers at the family cookout. Assembly required. Q 3200 Gas BBQ is rated 4.6 out of 5 by 74. Rated 5 out of 5 by Momsie from Awesome We have had our Weber for a while now and use it a lot year round!! 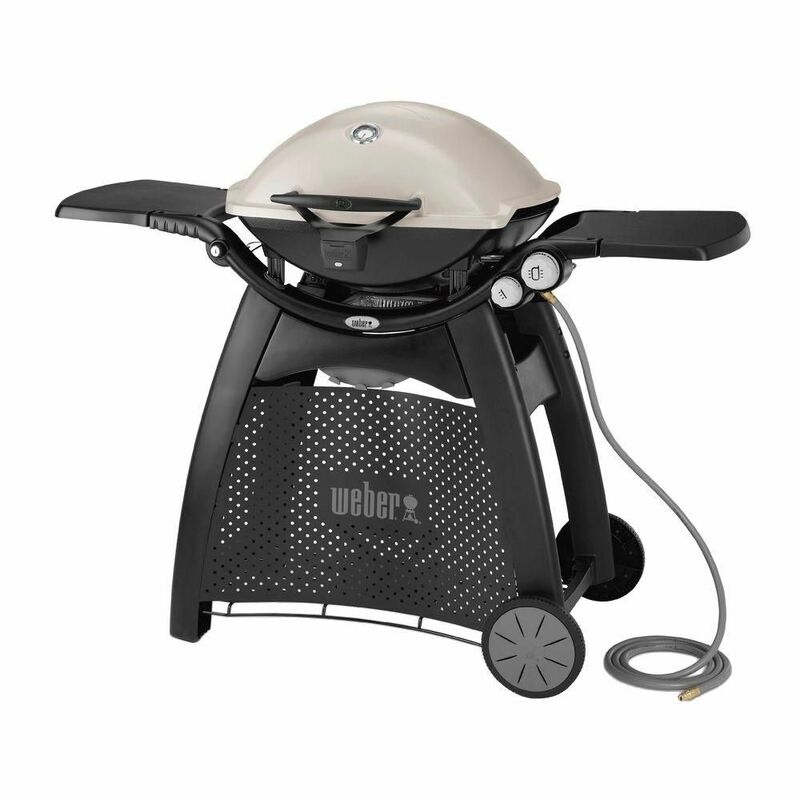 , We have full sized Weber’s before and this one does everything the big guys did with far less BTU’s. I would recommend this BBQ to anyone.. Rated 5 out of 5 by Bobby1 from Great I bought this 18 months ago and it’s still works great. Rated 5 out of 5 by JR Cook from The right size and great temperature control. Bought this about a year ago and have used it all through the past winter. Rated 5 out of 5 by Percy#01 from Awesome Great BBQ, I have 2 of these, one for home on Natural Gas, and a smaller one on propane for camping, very good product. Rated 3 out of 5 by Inthesky from Ok a couple of things I don’t like I like this bbq but there are a couple of things I wish were different. I wish you could light the left and right side only. And I wish the bbq height was higher so I could put a pot in it and still be able to close the lid. Does this come with the cart? Hi Lynnie, yes, the cart is included with this Q 3200 model grill. Thanks! Does this BBQ include the natural gas connection hose, as shown in the picture? Hi Kermodi, yes, this Q 3200 natural gas model does include the 10 foot hose, as well as a 3/8&quot; female quick disconnect fitting that is intended to be installed onto the end of your natural gas supply line. Thanks!